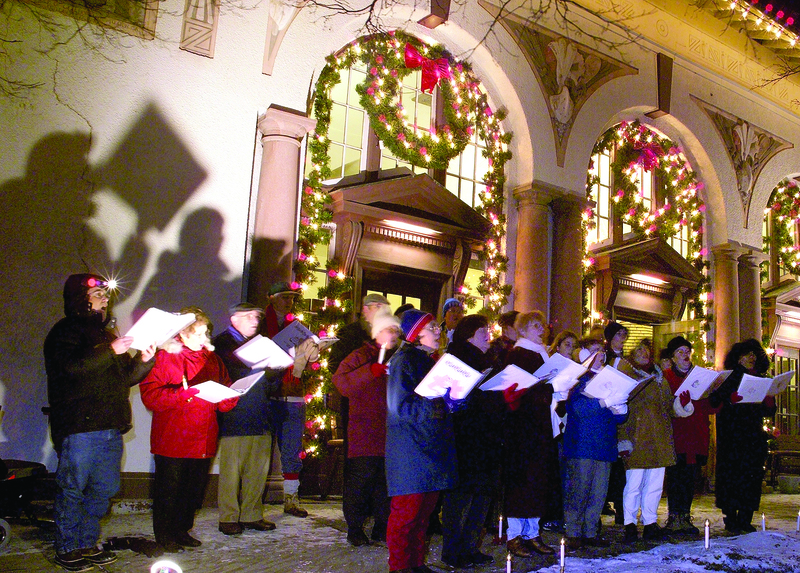 Carolers sing holiday songs in front of Adirondack Trust Co. on Broadway in Saratoga Springs during last year’s Victorian Streetwalk. This year’s event is Thursday, Nov. 29. The 32nd annual Victorian Streetwalk will be held Thursday night, Nov. 29. in downtown Saratoga Springs. Sponsored by the Saratoga Springs Downtown Business Association, it will run from 6-10 p.m. Broadway will be closed to vehicle traffic starting at p.m. to from the ea past the Saratoga City Center to the north to the Spring Street intersection to the south. CDTA, a festival gold sponsor, will run free shuttle buses to the downtown area every 20 minutes—4:30-10 p.m.—from four parking lots: the Empire State College lot at 111 West Ave. on the city’s west side; silver sponsor NYRA’s Oklahoma training track at East Avenue and Union Avenue; the National Museum of Dance on South Broadway; and the Weibel Avenue skating rink parking lots on the east side of Saratoga Springs. Shops will be open and there will be holiday-themed entertainment along Broadway during the event. The Saratoga Central Catholic School choir will perform at 5:45 p.m. at the Santa Clause hut near Caroline Street as the children wait for Santa and Mrs. Claus to arrive via Saratoga Horse & Carriage, escorted in by Santa’s elves and the Saratoga City Ballet Company. Children can visit Santa in the hut during the event, as well as at other designated times during the season. Mayor Meg Kelly will light the Christmas tree outside the hut at 6 p.m., followed by the CBA Marching Band, kicking off the evening starting at the City Center and marching down Broadway. Free entertainment includes the Flying Fingers Fiddlers, Spa City Duo, a Saratoga Springs Fire Department fire truck, Shenendehowa MS Select Choir, Saratoga City Ballet Dancers, Pokingbrook Morris Dancers, a cappella and brass groups from Skidmore College, Saratoga Soundtrack Chorus, Sax-O-Claus, a Saratoga County 4-H clubs gingerbread house display, The Ice Man, the Festival of Trees at the City Center, face painting, the Newfoundland Dog Club and the Octavo Singers. New this year will be excerpt performances of “he Nutcracker” at the National Museum of Dance on South Broadway. The Postoffice at Broadway and Church Street will have Christmas card envelopes stamped with a specially designed 32nd anniversary Victorian Streetwalk logo. Visit www.saratogaspringsdowntown.com for a full schedule and other information.